Discovered Evidence of Termites? Get Termite Treatment from the Area’s Leading Experts! 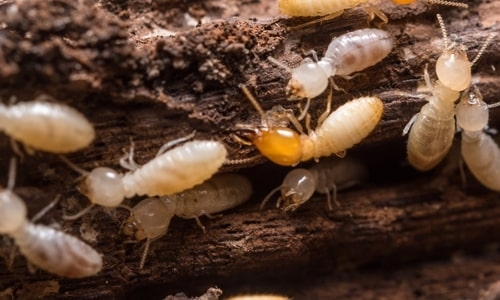 Every year, the Professional Pest Management Alliance devotes the second week of march to Termite Awareness Week, encouraging home and business owners to seek termite treatment if they believe their property is under attack. With the week wrapped up, it’s now more important than ever to schedule your property’s termite inspection and – if necessary – treatment. But, what if you haven’t had the opportunity to check for signs of termites yet? What if you’re not sure what to look for? Well, if that’s the case, this post has you covered! There are a number of surefire signs that your property is under attack by termites. The first – and most apparent – sign is swarming termites. If you notice small, white-winged, ant-like insects flitting about near the wood exterior of your property, it’s a definite sign that a swarm is nearby. The second sign is mud tubes. Mud tubes are small tubes made of soil, wood, and debris that are often found near termite nests. The third – and most reliable – sign is evidence of termite activity. This evidence most often appears as damage to the wood structure of your home. If you’ve discovered signs of termites, you’re probably asking yourself, “What should I do?” The answer is simple: call Keller Pest Control! As the area’s leading expert in termite treatment, we offer several different extermination methods: a traditional liquid treatment and a bait system. With years of experience and an unmatched guarantee, you can be confident that we’ll eliminate your home’s termites for good! At Keller Pest Control, we’re committed to offering the area’s most comprehensive extermination services. Whether you’re in need of a pretreatment on a new construction or you need commercial pest control for your retail business, you can count on us to work with you to identify problem points, eliminate existing pests, and – most importantly – prevent those pests from coming back.